Mark and Michelle have been teaching in NYC! The 2016 Expressive Therapies Summit was held November 10 – 13 in New York City. This conference addressed the healing arts in art, drama, music, writing, psychodrama, dance, sand and play therapy. This rich format included daylong intensives, master classes, workshops, community events, symposiums, and papers. Mark and Michelle were both honored faculty at this year’s Summit. Mark co-lead a panel presentation, and Michelle facilitated a workshop and a master class. 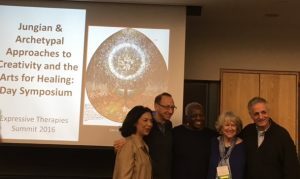 In this daylong symposium, Jungian analysts and art therapists discussed their work as it relates to Jungian psychology. Ther focus had an emphasis on making this information relevant to clinical work with clients in the expressive therapies. 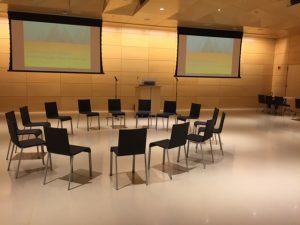 The panel speakers and the topics were selected to appeal to those who are new to Jungian ideas as well as those with more advanced training. Although primarily didactic, the day included some hands-on exercises and small-group discussions. Participants were encouraged to identify how they can incorporate the concepts presented into their daily work in clinical, educational, and community settings. devotional art in psychotherapy,” in which participants explored devotional paintings and objects, in historically and culturally sensitive ways. 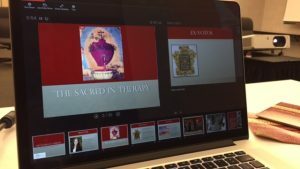 The ex-voto and its significant ability to express gratitude for surviving traumatic events were given particular attention as participants engaged in their devotional art experience. Mark and Michelle were sincerely appreciative of the opportunity to be faculty members at the 2016 Expressive Arts Therapies Summit. If you would like Mark or Michelle to visit your area for an educational experience, please contact us at contact@psychearts.org. Visit our website for more information about our services, workshops, and training opportunities. Sign up to receive blog posts and newsletters directly to your inbox. Please share this post with anyone who may benefit.